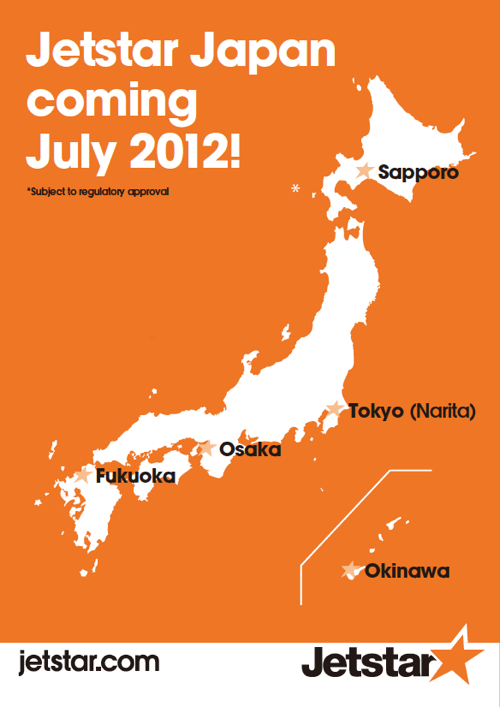 Jetstar Japan has brought forward its launch date to 03-Jul-2012, five months earlier than the previously announced Dec-2012, and confirmed an initial network of five major Japanese cities: Tokyo Narita, Osaka, Sapporo, Fukuoka and Okinawa. This appears to be a clear attempt to upstage incoming competitors, and kicks off what will be a stiff market battle, as Sapporo New Chitose and Fukuoka will also feature as launch destinations for Tokyo Narita-based AirAsia Japan and Osaka Kansai-based Peach Aviation. Jetstar Japan will commence operations around three months after Peach Aviation’s launch in Mar-2012 and a month ahead of AirAsia Japan’s currently scheduled launch of Aug-2012 (although this too is subject to change, depending on the availability of aircraft). At the end of Jan-2012, Jetstar Japan CEO Miyuki Suzuki had stated the carrier was ahead of schedule on its start-up plans, without providing an exact launch date. After many years of watching from the sidelines, Japan's LCC market is set to lift off with a bang this year – giving a big boost to the region's new entrant low cost airlines, which CAPA estimates will top 50 by the end of 2012, by far the largest volume of any region. 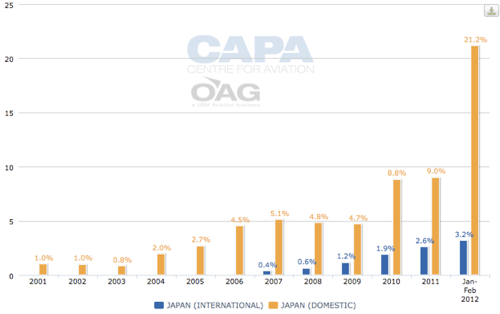 LCCs still only operate around 2.8% of total international capacity to/from Japan at present and LCC penetration within Japan also remains very low, at 9.0% in 2011 (it is even lower internationally at 2.6%), although this is higher than the intra-North Asia LCC penetration rate of 6.8%. This situation creates mouth-watering opportunities for the three incoming LCCs in view of the present under-exploitation of the market. And, the opportunities extend beyond the domestic Japanese market. These three new LCC establishments in Japan will help increase the number of LCCs in Asia to 50 by year-end according to CAPA estimates, and firmly entrench the LCC model in North Asia. Korea's full service airlines each have relatively timid versions of low cost subsidiary, but previous attempts by branded independent LCCs to establish local JVs have been rebuffed. But what is now happening in Japan will create even more powerful agents for change, and not just for Korea, but also for China. Remarkably, China has still not embraced the local establishment of LCCs - even though foreign branded LCCs now operate actively into the Chinese market. Their exclusion is mainly to allow adequate time for consolidation of the big three airlines, although some exceptions exist: Spring Airlines for example is a conspicuous, if still small, pioneering Chinese LCC, which coincidentally operates into the Tokyo Ibaraki low cost airport. In a study undertaken several years ago, CAPA estimated the north Asian triangle market (Japan, South Korea, Northeastern China) potential at over 200 million passengers a year - such is the potential, as economic growth permeates the region. But this would depend on substantial liberalisation of access and removal of other restrictive regulatory conditions in the Japan-Korea-North China triangle. The density and economic evolution of the sub-region’s urban markets is so startling that even this figure could be substantially under-estimated. That does, however, assume more comprehensive regulatory relaxation than is likely in the short term. If allowed to fly unrestricted between regional gateways, there are other, independent, LCCs in the market such as Skymark and Spring Airlines that also have the potential to generate very high levels of growth. Japan's three new LCCs will only enter progressively, but just the knowledge that they are on the way will dramatically shift the very cautious mindset that has kept Japan's aviation system the most expensive and under-exploited in the world. The Jetstar Japan announcement, accelerating the new carrier's entry, brings into sharp relief the urgency that now exists in Japan's marketplace. Jetstar Japan’s launch network of Tokyo Narita, Osaka, Sapporo, Fukuoka and Okinawa will be serviced by an initial fleet of three new A320 aircraft, configured with 180 seats, with the fleet size to growth to 24 aircraft “within the first few years”. But there are potentially big plans afoot. CEO of the start-up carrier, Ms Suzuki, in an interview with Bloomberg last month, stated the carrier may expand its fleet to 100 aircraft by the end of the decade. “I’m quite bullish that this is going to be possible,” she said. Tokyo Narita has been confirmed as Jetstar Japan’s first base and the airline is now on track to be the first LCC to operate domestically from the nation’s capital. Short-haul international services are expected to commence during 2013. While exact fares and schedules will be announced soon, Jetstar Japan has previously stated it plans to offer fares around 50% cheaper than full service airlines. The carrier, noting that "whenever low-cost carriers come in, the number of available seats expands quite rapidly”, is preparing for strong customer demand when fares to its first five destinations go on sale. “In a country that’s never had a true low fares domestic network, the ability to travel for an average of 50 per cent less will open up new places and opportunities,” Ms Suzuki said. Jetstar Group CEO Bruce Buchanan stated at the end of Dec-2011 that an agreement to add a fourth investor in Jetstar Japan could be concluded in 1Q2012. "It is not too far away. Once we knuckle through things, it will be three to four months," he said. As previously reported, the carrier is in talks with a number of potential investors interested in acquiring a stake in Jetstar Japan, since the carrier's JV startup with Japan Airlines and Mitsubishi. Mr Buchanan commented: "There are quite a few interested parties up there we want to ensure that the partner we bring on brings maximum strategic advantage for the business." With the addition of a new investor, Jetstar Japan will add a fourth partner and Mitsubishi will halve the size of its holding. Meanwhile, in another LCC development in the now-bustling domestic Japan market, AirAsia Japan obtained an Air Operator's Certificate (AOC) from the Japanese Civil Aviation Bureau on 01-Feb-2012. The AOC will enable AirAsia Japan , a JV between AirAsia and All Nippon Airways, to launch commercial services to international and domestic destinations in Aug-2012 at the latest, stating: "The company targets this joint venture to begin operations at the latest Aug-2012 but could be earlier subject to aircraft availability". AirAsia Japan is planning to deploy 180-seat A320 equipment from its home base of Tokyo Narita to Sapporo (New Chitose), Fukuoka and Okinawa (Naha) in Aug-2012 and Seoul/Incheon and Busan in Oct-2012. Aside from Busan, the four other routes are already served by parent, All Nippon Airways (ANA). AirAsia Japan CEO Kazuyuki Iwakata, in a Nov-2011 interview with Bloomberg, stated the LCC is planning to add long-haul services in 2013. The airline may offer services to Thailand, Indonesia and Singapore after introducing A330 aircraft, the CEO said. Mr Iawakata added that AirAsia Japan may order the A330s with AirAsia to lower costs. The LCC also plans to utilise AirAsia’s regionwide operations and marketing to reach a target of 10 million passengers p/a within five years, supported by a fleet of 30 more more aircraft. AirAsia Japan plans to operate to airports already served by affiliates as it expands on long-haul routes, so it can reduce costs through cooperation in areas such as procurement and distribution. The airline also intends to negotiate lower landing fees at airports it plans to serve. The CEO added the airline does not see All Nippon Airways and Japan Airlines as competitors, as it is seeking to attract a different market segment. AirAsia Japan President Kazuyuki Iwakata has stated the carrier wants to be the airline for "people who haven't flown before". Mr Iwakata said the carrier would offer domestic flights with service standards "that match the state of affairs in the country". He added that he is not concerned about competition from Jetstar Japan, stating the "market has room to develop." "Our partner AirAsia is overflowing with the kind of energy that could be called the starting point for an airline," he said, adding that ANA wants "to bring this momentum to Japan." Mr Iwakata's words echo previous comments made by ANA president Shinichiro Ito, whose airline will establish not one but two new low cost JV subsidiaries in the Japan market this year. Mr Ito stated he hopes the launch of the two ANA-affiliated LCCs, AirAsia Japan and Peach Aviation, will create new demand for air travel in the market. "We would like to create more opportunities for customers, including those who have never used airplanes to fly by setting up two companies that are totally different from the ANA brand, from a perspective of generating new aviation demand," Mr Ito said. Similarly, AirAsia Group CEO Tony Fernandes stated the Japan domestic market is large enough for both AirAsia Japan and Jetstar Japan. “No issue, the market is huge but Jetstar has many things to sort out in Asia, so it will be stretched,” Mr Fernandes said. Peach Aviation last month announced that from Mar-2012, it would commence service from its home base of Kansai International Airport to Fukuoaka (three times daily), Sapporo Shin-Chitose (four times daily) and Nagasaki (twice daily), followed by service to Kagoshima (twice daily) from 01-Apr-2012 and to Seoul Incheon from May-2012. Accentuating Peach's more immediate international plans the carrier plans, post-Jul-2012, to operate Okinawa, Taipei Taoyuan and Hong Kong services..
Airfares for the Osaka Kansai-Nagasaki route are set to be launched on 25-Mar-2012 and Osaka Kansai-Kagoshima scheduled for launch on 01-Apr-2012. 'Happy Peach' one-way fares will range from JPY3780 (USD49) and JPY11,780 (USD151) on the Nagasaki route, and from JPY4280 (USD55) and JPY13,280 (USD171) on Kagoshima route. Airfares with the “Happy Peach Plus” for the Nagasaki route will range from JPY5480 (USD70) to JPY15,780 (USD203) and on the Kagoshima route from JPY5980 (USD77) and JPY17,780 (USD229). The airfares will be available until 30-Jun-2012. Japan's public has had a long wait for serious international-standard LCC operations in its market. But that is about to change in a big way.